*I had a full day today before I even headed to work at about 9:15 a.m.
*Nikki and I performed our morning walking routine with Butters the Poodle. Around 7:30 a.m., Robert Paul of Flame Heating rang our doorbell, and was here to service and fix our faulty furnace. The problem was just was Paul anticipated....it needed a new Thermocouple. It also needed cleaning and oiled, and that was done as well. *At 8:30 a.m., I drove over to the Kellogg School District Office to take care of some business. I met with Angela, the business manager, and we finalized the June Gear Up invoice, which is my final Gear Up invoice submission. I also needed a document notarized, which Cindy Burkart was nice to take care of for me. Then I made some copies of some items, and now, hopefully, I have all my paperwork in order so when I submit them tomorrow at the PERSI office in Coeur d’Alene, my retirement process will proceed as needed. 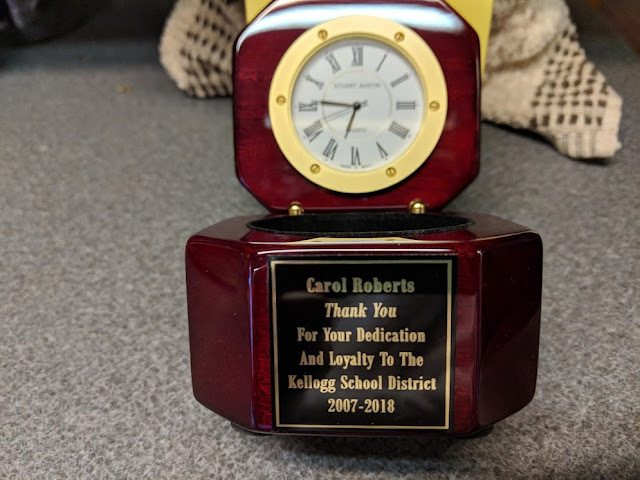 *Before I left the KSD office, current superintendent Woody Woodford presented me with a nice gift from the KSD, a small clock with a personalized inscription on it. (The last time he did this, at KHS, it was a funny joke because they had not had mine made yet, so I was presented with Woody’s clock, and had to give it back to him. He assured me that I could keep this one!!) It has been a pleasure working under Woody. We actually both started working for the KSD at the same time, in 2007. *As I was at the district office this morning, I was reminded that this was where I had my very first job, at the age of 15. Back then, Merv Hill, who was the business manager, would hire student to help out with miscellaneous jobs at the district office, such as stamping new text books, repairing text book, going through the “dead files”, making “dittos”, and whatever else needed done. It was a great first “real job” to have back in my teens. *I got back home and got my lunch ready to head to work. As I was doing this, Christy was at her house getting ready for Debbie to take her to Coeur d’Alene to check into Kootenai Medical Center for her knee replacement surgery. I am happy to report that the surgery went well, and, after her blood pressure became more stable after the spinal block, Christy was brought to her room, where she was greeted by Bill and Everett. All reports from Coeur d’Alene were good. I will drive down tomorrow and pick her up from the hospital and bring her home. Christy has worked very hard at preparing for this surgery by eating better, losing weight, doing Physical Therapy, and following all the directions that were asked of her. I anticipate that this will help in her healing and recovery process, as she continues to “follow the doctors orders”. *Work was good today. The warmer weather means more people are buying the delicious Brain Freeze ice cream in the ice cream parlor at the Mine Tour. One thing I feel like I have noticed already this summer is women traveling on their own. I think I mentioned the one lady RVer, who has traveled on the road by herself for the last nine years. Yesterday I met a woman who grew up in Washington, but now lives in Arkansas. Her husband stayed in Arkansas while she traveled back to Washington so see family. Today she was traveling around the area doing some exploring, and Wallace, Idaho was on her list. *Lamb chops were on the menu again tonight. I also picked some Swiss Chard from the garden, and sauteed it in ghee, with some onions and red peppers. And I picked some different types of salad greens from the garden to make a salad. I am so thankful that I can pick fresh produce right from the garden and prepare a meal with all those delicious flavors. I look forward to having tomatoes ripening, summer squash, peas, Brussels sprouts, cabbage, radishes and green beans.